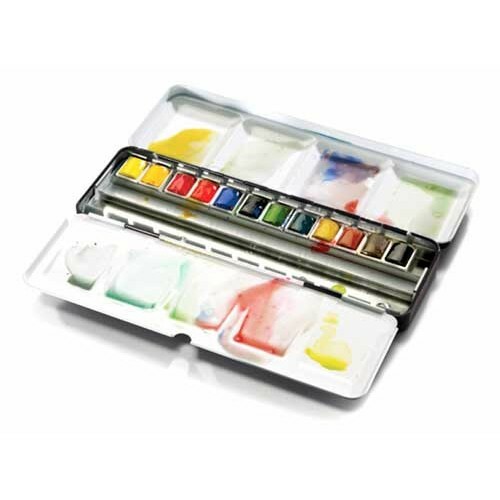 A lightweight black enamelled box containing 12 assorted Artists’ Water Colour half pans with space for an additional 12 colours. Includes: Winsor Yellow, Lemon Yellow (Nickel Titanate), Winsor Red, Permanent Carmine, French Ultramarine, Prussian Blue, Winsor Green (Blue Umber), Permanent Sap Green, Yellow Ochre, Burnt Sienna, Raw Umber, Ivory Black. Actual contents may vary.